to them, that is bullish. 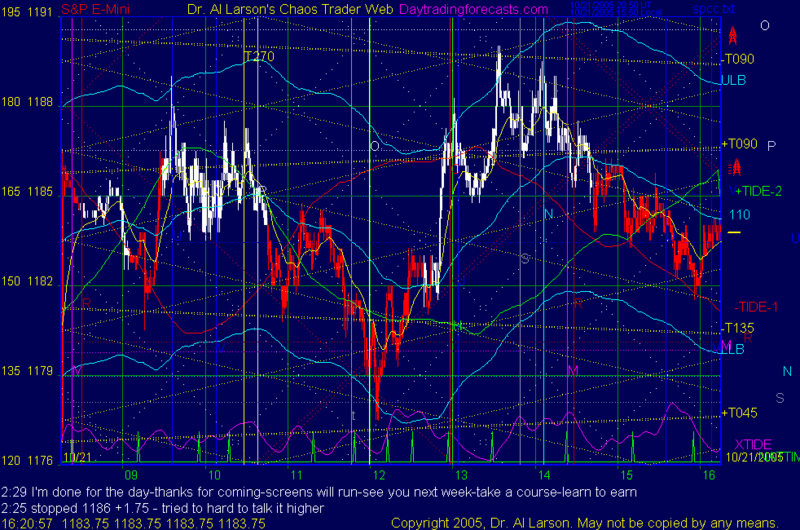 11:08 looks like a trading range day-I have to run an errand-back in 30 min. 10/21/2005 11:16:22 AM Mountain mjs:: Dr Al Monkey Trader says that's the way to Tarzan Swing. You just hold onto the vile and float back an forth with your monkey arm out and pretty soon you will catch a good vine and off you go to the next bananna tree. 10/21/2005 11:12:52 AM Mountain mjs:: There is a pretty large community of scientist who say the universe is 10 deminisions. Some say we can only go to the other 6 deminisions in our brains or really our consciousness which really isn't a physical part of our bodies/brains but the energy force inter action facilitied by the electrical wiring of our heads. But you have to admit 6 more deminisions is a lot of room to move around in. 10/21/2005 10:54:02 AM Mountain mjs:: Hey MM. No not a member of IONS. But I can tell you many stranger than fictions stories that have happened to people I have run into like that. There are many in Central and South America who have not been "culturalized" by our rational society to disregard the coincidence and deja vu aspects of time and space. So they know and see spirits etc. which many now think may be electro magnetic signitures of past, present and future. 10/21/2005 10:45:57 AM Mountain Ben:: Al, did you place the buy stop at 1184.25 because it is 1 point above the 55 min donchian channel? 10/21/2005 9:46:12 AM Mountain mm:: mjs - I was impressed by your story last Friday of yoyur 1969 experience in Nam - do you happen to be a member of IONS? 10/21/2005 9:15:11 AM Mountain mjs:: The solar wind had a spike similiar to the SP in the last 2 hrs. Check it out. 10/21/2005 8:19:28 AM Mountain mjs:: The Monkey Cheerleaderes have banana pomp pomp Al. But they generally come out around Fed Rate Change days. Monkey Trader says this is Tarzan Trading - you know swinging on vines in the old hand over hand to the next vine - real easy to lose your grip and crash to the jungle floor. 10/21/2005 8:09:36 AM Mountain Ben:: Trying to trade this thing is like riding a bucking bronco. Hey mjs, you got your spurs on? 10/21/2005 7:59:51 AM Mountain Al:: mjs: do you have pomp pomps?